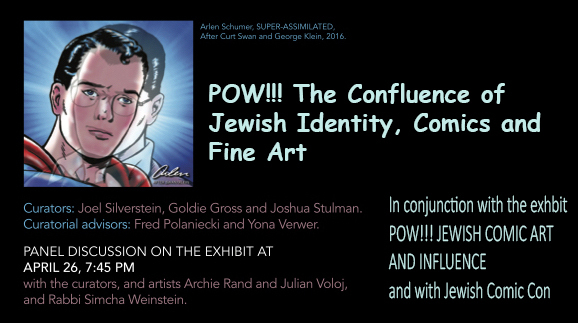 In conjunction with Jewish Comic Con and Congregation Kol Israel, The Jewish Art Salon will host the exhibition POW!!! Jewish Comic Art and Influence. Curators: Joel Silverstein, Goldie Gross and Joshua Stulman. Opening Thursday, April 26, 2018 at 7:00- 9:00 PM. 603 St. Johns Place Brooklyn, NY 11238. Presented by the Jewish Art Salon and the Brooklyn Jewish Art Gallery. The exhibition will be on view Sundays 11AM – 2PM, until May 20, 2018. Panel discussion on the exhibit at 7:45 PM. The discussion will feature the curators, artists Archie Rand and Julian Voloj, and Rabbi Simcha Weinstein of Pratt Institute. The panel will be introduced by Yona Verwer, Director of the Jewish Art Salon. More info on the panel here. Curatorial advisors: Fred Polaniecki and Yona Verwer. This event is co-sponsored by Pratt Hadas Gallery, Be’chol Lashon, and AH Comics, publisher of SCI: The Jewish Comics Anthology, Vol. 2, edited by Steve Bergson, Grow and Behold, and Elul Wines. Founded in 1924, Congregation Kol Israel is the oldest continuously practicing Orthodox community in Prospect Heights. From Chasidic to Modern Orthodox to just plain curious, we are proud to count people from a wide variety of religious backgrounds as members. The Brooklyn Jewish Art Gallery is a partnership between artists and lovers of the Jewish arts. The goal is to provide an artist showcase in a landmarked congregation. Funds raised by the gallery support the artists and go toward the renovation of the 90 year Congregation Kol Israel. The Jewish Art Salon is the largest Jewish visual art organization in the world. It provides important programs and resources; since 2008 it has organized 30 exhibits and 40 art events in the USA and Israel.